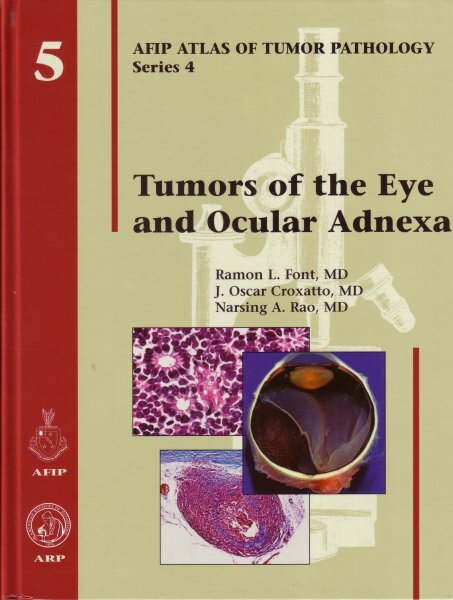 When a specimen representing a tumor or tumor-like lesion of the eye or ocular adnexa is received in most general surgical pathology laboratories, the immediate reaction is one of panic. This is because these tumors are so seldom encountered and often require complex gross dissections, based on a knowledge of ocular anatomy, wich most general surgical pathologists either never possessed or have long since forgotten. Drs. Font, Croxatto, and Rao state that their main objective is to emphasize the important features of these lesions of special interest to general and surgical pathologists; their success is measured by the extent to which this matierial becomes immediately accessible to pathologists with little or no previous experience in ophthalmic pathology. In addition to providing complete descriptions of the tumors and tumor-like lesions encountered in the various compartments of the eye and ocular adnexa, the authors correlate the pathologic features with epidemiologic and pathogenetic observations, clinical features, differential diagnosis, and special studies including immunohistochemistry and various molecular approaches. Each anatomic site has a section on normal anatomy and histology, and there is a separate chapter on the pathologic examination of ocular specimens, so that the general pathologist can approach these uncommonly encountered specimens with confidence. Because of its scholarly yet practical, well- illustrated and well-referenced approach, this work will appeal to pathologists and ophthalmologists alike.